A New Reality with Pixel Red. 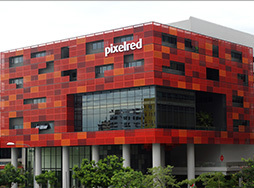 An innovation hub, a centre for interactive technology, an oasis for creativity, boldness and break-out communication ideas – where else but at Pixel Red! We conceptualised and designed Pixel Red with a singular aim in mind – to be the catalyst for change in packaging printing! In keeping with the philosophy of this centre of innovation and creativity, we adopted an eye-catching façade for the structure – composition of spectacular red rectangular forms representative of pixels from printing. We wanted to integrate traditional solutions with new media technologies and game-changing solutions. We aimed to deliver to the world a new paradigm – to bring the traditional focus on manufacturing, production and distribution into a new reality – where consumers demand convenience, accessibility, information, personalisation and bespoke experiences. We now live the Pixel Red vision! We provide business-focused, consumer centric solutions. From market intelligence to new media, marketing and communications, we help brands create value. With our integrated and interactive solutions we provide the engagement between your products and your customers through Augmented Reality, video, mobile and social media channels. We make brands come alive and we envelope consumers in the experience. Ultimately, we drive your brand value and we create experiences for customers. We are innovation, we are communication, we are education, we are engagement, we are interaction, we are... everything you could possibly want or need to reach your consumers! Realise new possibilities – step into the brave new world of Pixel Red!